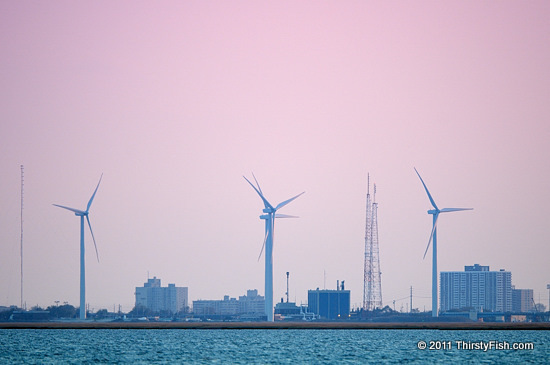 This is a view of the Jersey-Atlantic Wind Farm in Atlantic City, New Jersey. The photo was taken from Edwin B. Forsythe National Wildlife Refuge which is located just North of Atlantic City. The wind farm is made up of five 1.5 megawatt turbines, total of which can power 2500 homes. Windmills, devices that convert the energy of wind to mechanical energy to mill grain or draw up water, have been around for about 2000 years. A wind turbine is a windmill that converts wind energy into electricity. The first wind turbine was installed in 1887 in Scotland. Up until the 1973 oil crisis, wind turbines were generally small scale, individual generators. In the decades that followed the crisis, non-petroleum energy sources have gained increasing research interest. Wind power does not consume fuel, does not emit pollution, is environmentally safe, and there is no possibility of a nuclear disaster. So why isn't everything powered by the wind already?